This restaurant came highly recommended (by the same friend who pointed me to flat white, so who am I to argue! 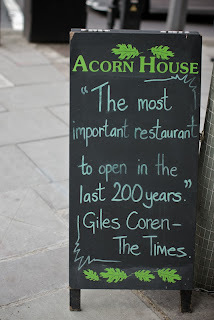 ), so for my last dinner in London, which was to be with friends who live there, I requested that we dine at Acorn House. It's walking distance from the King's Cross/St. Pancras train station, which happens to be the London base for the Eurostar to Paris. Acorn House is unique in that the chef makes exceptional efforts to be 'green' about everything that comes in and out of his restaurant. I picked up his cookbook, and the forward is written by Jamie Oliver who goes as far as to call him the "original green chef". A big part of this is purchasing local, sustainable ingredients, and only buying what's in season. The menu is actually updated twice a day to accommodate! 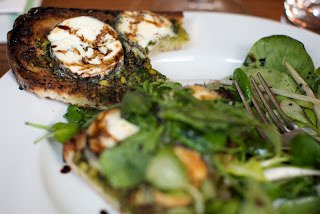 My appetizer was a fantastic goat cheese on toast with a pistachio pesto (!) and a very sticky, very black, balsamic drizzle. It was absolutely divine, and so unfortunately I had to eat the whole thing. Hate it when that happens. 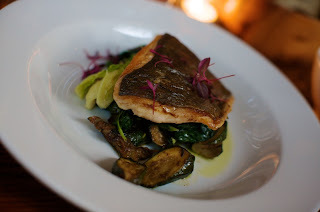 Next up was a pan fried sea trout, which was good but honestly a little fishy. I didn't find the dish to be remarkable, although the presentation was very nice. My friend had the pork belly with feijoada which he really enjoyed, so perhaps I'd try that next time. Of course this was accompanied by a fine bottle of wine. Like the rest of the menu, they go to great lengths to find quality organic wines, but even here there was the 'next level' of organic; biodynamic [wiki link]. It's a holistic approach to growing the grapes, and since everything else about the evening was so green (yes I took the train to get there! 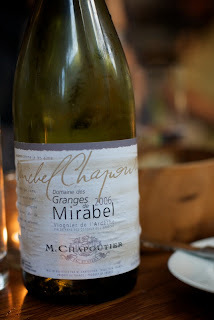 ), I decided that we had to try one of these special wines. I must say the wine was superb. I won't try to review the wine here as this meal was now several days ago and I didn't take any notes, but again it was absolutely delicious; enough so that I photographed the label so I could track it down later. Overall a good meal and an enjoyable, learning experience. I'll likely go again, preferably in a different season just to see how the menu has changed. verdict: I love the 'green-ness' of the place. It's a great idea who's time has come, and the quality of (most of) the food shows it. I'll be back in a different season, and I did buy the cookbook so look forward to trying a few things at home.